More than half of the Bihar government’s total revenues come from its share in central taxes. The chart below shows the share of central taxes and grants from the centre as a percentage of states’ total budget revenues. The data are for the revised estimates for the fiscal year 2011-12. Note that its share in central taxes makes up 51.3% of the Bihar government’s total revenues. Grants from the centre accounted for another 24.3%. Adding up the two, more than three-quarters of the state’s total revenues in its budget comes from resources from the centre. Bihar has certainly been growing rapidly in recent years, but the funds enabling that growth have come from the central government. As far as budgetary support is concerned, Bihar already has a rather special status. Of course, Bihar is the country’s poorest state, with a per capita income, at current prices, of ₹ 22,691 in 2011-12, far below the national average of ₹ 61,564 that year. Its poverty headcount and human development indicators are terrible. It is for these reasons that the region already enjoys large resource transfers from the central government. But consider Uttar Pradesh, another poor state with a per capita income of ₹ 30,051 in 2011-12. The chart shows that its share of central taxes made up 37.7% of the state’s budgetary revenues, while grants from the centre contributed another 15.4%. Thus, slightly more than half of the total revenue raised by the state government in 2011-12 was from the central government’s resources. But that’s a far cry from the more than three-fourths of revenue contributed by the central government for Bihar’s budget. The share of grants from the centre in their state budgets is higher for the special category states—Jammu and Kashmir, the northeastern states, Uttarakhand and Himachal Pradesh. But it’s also worth noting that the centre contributes a lower percentage of revenues in the budgets of many of the special category states. In 2011-12, Bihar also benefited from loans taken from the centre. It was the second-highest borrower from the centre that year, with Andhra Pradesh heading the list. Uttar Pradesh’s borrowing was less than half of Bihar’s. That doesn’t mean, though, that Bihar’s borrowing is reason for concern. According to the 2011-12 state budget revised estimates, Bihar’s debt to gross state domestic product (GSDP) was 29%, well below that of Uttar Pradesh, at 38.7% of GSDP, or West Bengal, with a debt-to-GSDP ratio of 38.6%. Among the non-special category states, Punjab and Rajasthan had higher debt-GSDP ratios than Bihar. No wonder then that Uttar Pradesh too is pleading for special status. Bihar’s own tax revenue, or the amount raised by taxes within the state, is around 5.1% of the state GDP, taking the 2011-12 revised estimates for tax revenues. Because of the state’s low per capita income, it’s difficult for it to raise tax revenues. 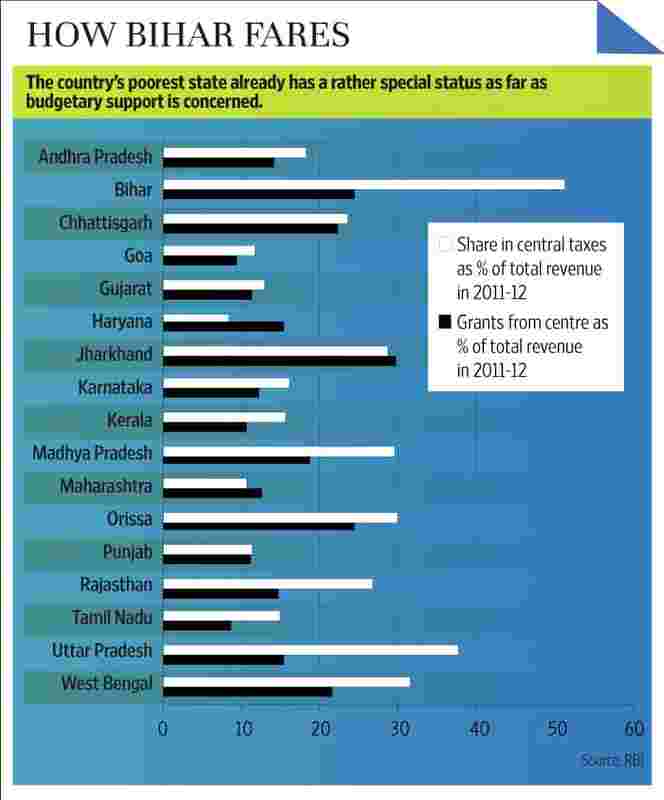 Jharkhand, another poor state, had an own tax revenue to state GDP percentage of 5.5%. And West Bengal scored even lower than Bihar, at 4.6%, despite having much higher income. But Uttar Pradesh, in spite of a low per capita income, manages to raise much more resources. It had an own tax revenue to state GDP percentage of 7.4%. That’s higher than several rich states. For example, this yardstick was 6.8% for both Haryana and Gujarat. Perhaps Bihar’s case for more largesse from the Centre stems from a comparison with the special category states, all of whom have per capita incomes higher than Bihar. Why should Sikkim, with a per capita income of ₹ 121,440, have special category status, while Bihar with a per capita income of less than a fifth of that amount, does not? Uttarakhand and Himachal Pradesh have per capita incomes of 3.5 and 3.3 times Bihar’s per capita income, yet they enjoy special category status. The Planning Commission has found that, in spite of the recent spurt in growth among the poorer states such as Bihar, Jharkhand and Madhya Pradesh, there hasn’t been any significant improvement in income disparities, because population growth has been higher in the poorer states. Inter-state inequalities, as measured by the Gini coefficient, have been increasing. The Planning Commission states categorically, “We do not see the phenomenon of convergence across Indian states, whereby the poorer states, by virtue of growing faster than the richer states, start catching up with the level of income of the latter." But even if states are helped by the centre, do they in turn help their poorest districts? The Planning Commission has found that the ratio of per capita district GDP of Patna to Sheohar district, which has the lowest income in Bihar, increased from 6.68 in 1999-2000 to 8.65 in 2006-07. And in Bihar’s Madhepura district, the poverty headcount ratio varies from 19.83% in Bihariganj block to 71.01% in Puraini block. Will the money actually go the poorest people in the poorest blocks?